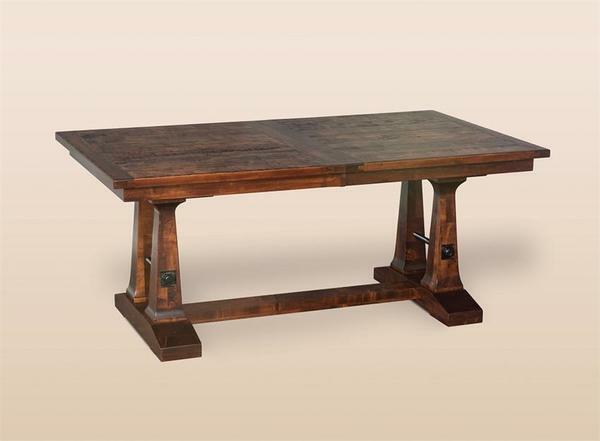 A truly grand dining table, the Vienna Plank Top Trestle Dining Table is indeed built by hand to impress. There's lots of rich thick wood here with a 1 3/8" thick table top. We'd describe dining at the Vienna as warm and comfortable---like you're visiting with a dear friend. The wood planks are positioned perfectly with breadboard ends creating contrast and a rustic appeal. The base of the Vienna is rich and thick as well, with a solid bridge connecting the trestle base. Picture family, friends, and loved ones gathered here together for a wonderful dinner, dessert and healthy dose of catch-up. The Vienna Plank Top Trestle Dining Table is shown here in hand planed brown maple wood with Michael's cherry stain and Van dyke brown glaze. Matches beautifully with the Amish Vienna Trestle Dining Benches. Available in two sizes: 42" x 72" and 48" x 72"
Our Amish woodworkers like you to take a close look. They are dedicated to perfecting all the details large and small to create the finest experiences with your new furniture. Custom options let you create a dining table with just the right look and features for you and your family and we love being able to offer you choices. Click on select options online or feel free to get in touch. We have a team of Furniture Specialists who can assist you with questions on wood, finish, and special furniture features. We thank you for shopping DutchCrafters and can't wait for your new dining table to join you and your family. - Heavy Distressing - Our ultimate antique finish. Rub-through of the rich patina are masterfully punctuated with another level of extensive nicks, pin holes, eased edges, simulated cracks and other distressing techniques to bespeak several centuries of robust wear and loving care. Shown in hand-planed Brown Maple with Michaels Cherry Stain and Van Dyke Brown Glaze.